Tesla is trading near its lowest price in months – and investors on the free-trading app Robinhood appear to be buying the dip. The strategy of loading up on shares during sell-offs has become extremely popular during the 9 1/2-year bull market. All eyes are on now on the company’s third-quarter earnings report later this month. Tesla shares have plunged more than 30% from their recent highs, but investors on Robinhood, a free-trading app popular among younger traders, seem to be betting on an earnings rally. According to weekly data tracked by Business Insider, more than 111,000 Robinhood investors currently hold Tesla shares. That’s the highest number since Business Insider began tracking the data in March, up more than 16,000 from last week. It makes the electric-car maker the 13th most-popular stock on the app, behind Twitter and above Netflix. 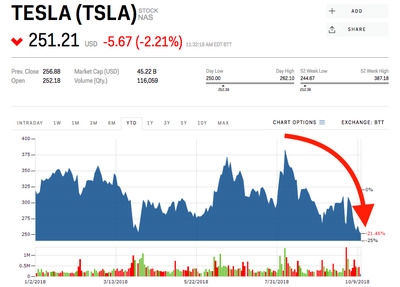 The recent selling, which has wiped out more than $US17 billion in market capitalisation, comes as Tesla’s board of directors is tasked with finding a replacement for CEO Elon Musk as chairman following his $US20 million settlement with the Securities and Exchange Commission over his now-infamous failed go-private bid. 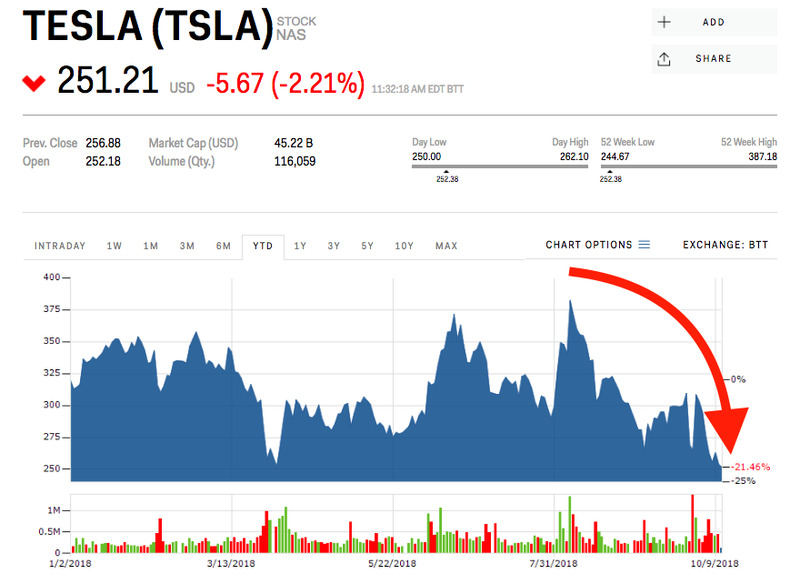 Shares of the company briefly rebounded in response to the settlement, which allowed Musk to avoid any admission of guilt or going to court, before plunging to their lowest close in over 1 1/2 years following a series of tweets from Musk that targeted the Securities and Exchange Commission, the US’s top stock-market regulator. “Just want to that the Shortseller Enrichment Commission is doing incredible work,” he said. “And the name change is so on point!” He went on to apologise for the typo, but stood by the joke. With the go-private saga in the rear-view mirror, all eyes are on Tesla’s third-quarter earnings report, expected at the end of October. Last week, the electric-car maker topped Wall Street’s total vehicle numbers, though it’s unclear if that will translate to the company becoming profitable, as Musk has said will happen this year. Wall Street remains markedly bearish on the stock, with analysts polled by Bloomberg expecting an adjusted loss of $US0.11 per share, a significant improvement from the previous quarter, but still in the red. Their average price target is $US303 – about 18% above where shares were trading on Thursday. The consensus is up a bit from last week, fuelled by a newly bullish analyst who initiated coverage this week. Maynard Um, who recently joined Macquarie from Wells Fargo, initiated coverage with a price target of $US430 a share – a full 40% above the Wall Street consensus. Unlike most other analysts, Um sees no need for a fresh capital infusion this year, and says the $US1.2 billion outstanding debt is no worry. “We believe the manufacturing issues are improving and will continue to improve moving forward,” Um wrote. If Um’s thesis comes true, it could be a boon for millennial investors on Robinhood who appear to be buying the dip in Tesla’s stock. The practice of loading up on stocks during sell-offs has become extremely popular among investors of all ranks as the 9 1/2-year bull market chugs along. Tesla shares are down 21% this year.